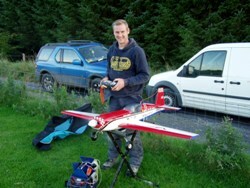 The club was set up in 2004 by a small group of RC model aircraft enthusiasts who started flying from a football pitch at Culleenamore, Strandhill. In 2006 we moved to our present airfield at Annaghmore near Collooney, more details of which may be found on the Where We Fly page. Click here to read about the day a full size Cessna 180 paid us a visit! We fly mostly fuel powered airplanes from humble trainers to aerobatic to large scale replicas. 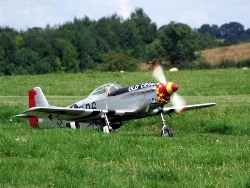 Model helicopters are becoming increasingly popular amongst some of the members and one or two also fly gliders. In fact we don't restrict ourselves to flying, some members have remote controlled cars and we have even attached aircraft engines and propellers to our own airboat designs! We fly every weekend and some summer weekday evenings (weather permitting). We welcome anyone to join and recommend that you meet us first to get a feel for the sport. We would be delighted to start you in the right direction. Aircraft, radio, engine and fuel choices all have an impact on your success; some helpful information can be found on the Info & Links page. We also welcome anyone to come and watch us fly. However in the interest of your safety you must ask the members present before entering the flying field. Please feel free to get in contact with us by using the Contact Us page. Information, photos etc may also be sent direct to info-at-sligomfc-dot-com. Thanks for visiting our website, we hope to see you at the flying field. For more events check out the MACI event calendar. © SLIGO MODEL FLYING CLUB 2005 - 2019. No information, image or photograph on this site may be copied or reproduced without prior written consent. This website has been designed to display correctly in all browsers. If you have found any fault please let us know!